This was the direct predecessor of the English concertina. It is mouth-blown through the ivory mouthpiece. The keys on each side of the instrument are clearly visible. The layout is the same as for an English concertina. It is surprisingly small - I have included a match in the picture to give some idea of scale. The workmanship is exquisite. 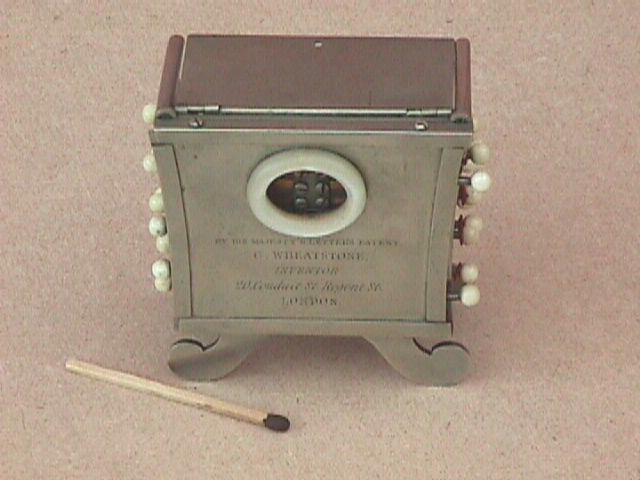 It is a somewhat clumsy instrument to play, which must have led Wheastone to the development of the bellows powered concertina. This picture is of symphonium no. 144, currently in the possession of Colin Dipper, who loaned it to me when I assisted in a television programme about Charles Wheatstone. It was found in a junk shop, having been made into a pincushion! Colin values it at about £2500, so start searching those junk shops!